Graphic designer Ida Woldemichael creates an elegant space, full of mementos from her travels. 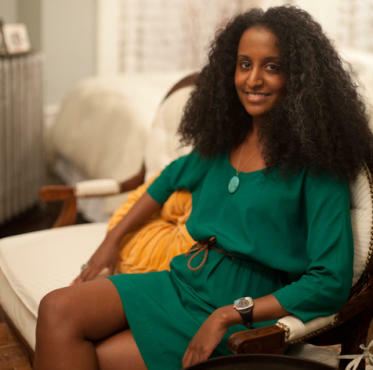 When Clinton Foundation graphic designer Ida Woldemichael (idawoldemichael.com) signed the lease to her Harlem studio apartment in November 2009, she tapped into her creative side to maximize the small space. "I make a goal of going to at least one [foreign destination] each year," says Woldemichael, whose eclectic souvenirs range from colorful woven baskets from Africa, to a license plate from the Bahamas. "I like to be very organized---everything needs a home, everything has a place," says the Virginia transplant, who strategically chose decorative pieces that double as storage. By angling her bed and vintage settee to open up the room, and selecting a light, neutral color palette, Woldemichael transformed her 295-square-foot domicile into an elegant yet welcoming pad. To create the centerpiece for her glass-tiled fireplace, Woldemichael paired a vintage leather briefcase (a thrift-store find) with assorted candles procured from Jack's 99 Store (jacks99world.com) and gifted by her mother. Woldemichael surfs Apartment Therapy (apartmenttherapy.com) and Google Images for inspiration. The latter led her to these hand-stitched Moroccan leather poufs from Imports from Marrakesh (importsfrommarrakesh.com). Woldemichael is always rummaging through her mom's house for items she's ready to get rid of---such as this old desk, which Woldemichael repainted and embellished with mismatched drawer knobs from Anthropologie (anthropologie.com). A graphic design theme resonates throughout the apartment, right down to accent pieces like these drink coasters, which were made by Ellen Lupton (elupton.com), curator of contemporary design at the Cooper-Hewitt National Design Museum and director of the graphic-design M.F.A. program at Woldemichael's alma mater, Maryland Institute College of Art. 6"My twin sister and Iused to have this in our room, so I painted it and added pennies to it,"
says Woldemichael of a trunk she spruced up to store her design portfolio. Woldemichael adorns her walls with found items, such as Altoids tins, bus tickets from a recent trip to visit family in Eritrea and an advertisement for a font. "I tend to like a lot of things with typography on them," she says. "I have an obsession with vintage things," says the flea-market connoisseur. Woldemichael frequents the Upper West Side GreenFlea (greenfleamarkets.com) and the Hell's Kitchen Flea Market (hellskitchenfleamarket.com) to scout odds and ends like this antique metal tray that showcases her family photos.